See the list of all ISL Online user stories. Anyway, the contest for Facebook ‘likes continues, so stay tuned for more updates. 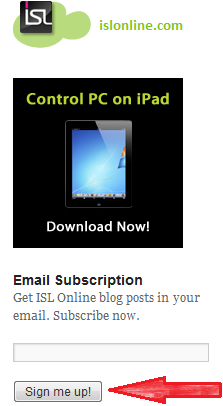 To get ISL Online Blog posts to your mailbox, subscribe to RSS feeds or create an email subscription (see the screenshot). This entry was posted in Uncategorized and tagged contest, isl online, user story. Bookmark the permalink.